Home » News » Apple Store in Mysuru tops India sale for 6 days! 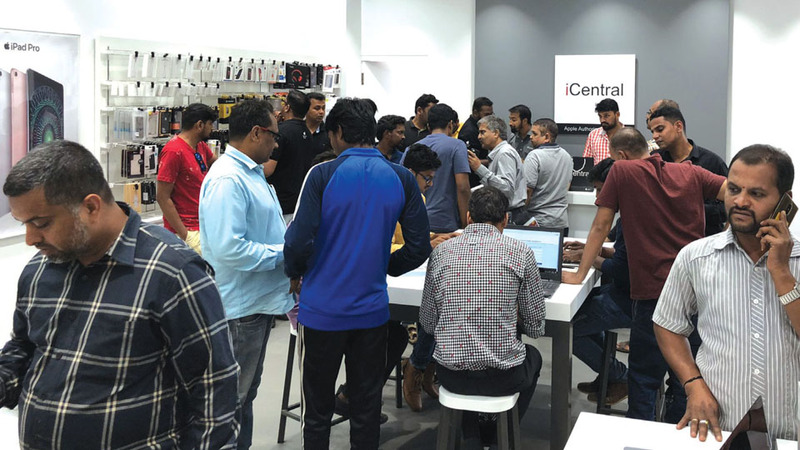 Mysuru: iCentral, the Apple Store at Forum Centre City Mall at Nazarbad in city hit the top position among all the Apple stores in India recording a sale of 340 iPhones and iPads between Feb. 9 and 14. On Feb. 14, it recorded the highest sale in the country – a rare achievement for a store in a tier-two city like Mysuru. Speaking to Star of Mysore, H.R. Keshav, one of the partners of iCentral said that Apple had a Valentine’s Day offer from Feb. 9 to 14 and the sale began at 10 am on Feb. 9 and went on till midnight of Feb. 14. “We sold 247 iPhones and 88 iPads during the period. On an average, a store like ours sells over 70 to 80 iPhones and iPads in a month. But here, we have achieved a three-month target in six days flat,” they said. “We were able to stand in Number One position in India and we beat all the store sales in other metropolitan cities, thanks to the media campaign. We had inserted advertisements in Star of Mysore and its sister concern Mysooru Mithra and this paid off,” they said. “This is an achievement as our store is just about a month old,” they added. Keshav said that there was heavy rush at their store on all six days and the response was tremendous. “Many customers complimented on our pricing, quality, service and customer support. We are proud to say that the media campaign we did for the Valentine’s Day offer even helped our competitors in Mysuru to double their sales in six days,” he said. Vineeth Venugopal, D.K. Venugopalan and B.C. Satish Kumar are the other partners of iCentral that has branches in Mangaluru and Hubballi.